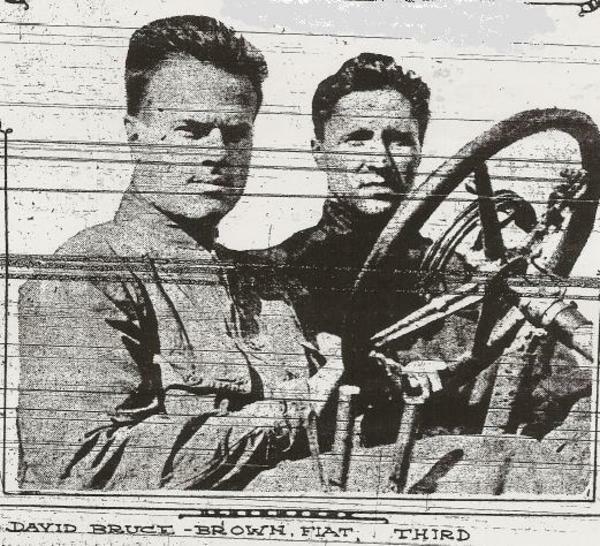 This is one of the most popular images of David Loney Bruce-Brown, one of the most interesting personalities of early auto racing. Versatile, Bruce-Brown was widely recognized by his peers as among the very best of their profession. 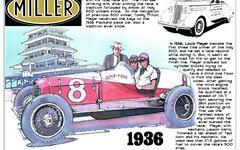 He won the American Grand Prize twice (1910 & 1911) as well as a host of hill climbs. Bruce-Brown led most of the first half of the 1911 Indianapolis 500, but tire failure and ignition trouble thwarted his drive for victory. He did salvage third. Bruce-Brown dominated the first day of a two-day 1912 French Grand Prix but was disqualified in a controversial decision for refueling his car away from the pit area. Bruce-Brown was killed on a Milwaukee road course while practicing for the American Grand Prize in October 1912. Pictured with him here is Anthony "Tony" Scudellari, his riding mechanic who also lost his life in the accident. The story of Bruce-Brown's life is obscured by the mist of time as folklore tends to overwhelm the facts at times. This is no more evidenced by the embellished recollections of such men as Fred Wagner in his popular if many time times exaggerated book, "Saga of the Roaring Road," available on First Super Speedway at no charge. If you would like to know more about David Bruce-Brown, read my feature story about him in the 2009 Indianapolis 500 Program. This photo appeared in the May 31, 1911, edition of the Indianapolis Star.